Thread for our NB kits starting from next season. I would not worry how it looks. Have any of these 'leaked' kits ever turn out to be true? 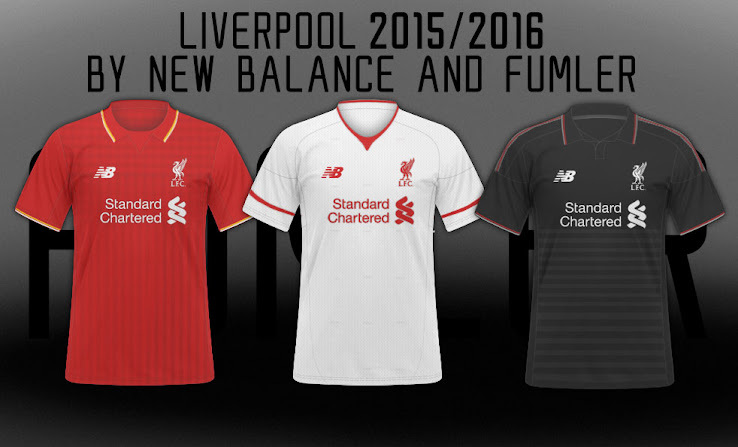 Warrior was always New Balance, just their football brand...It's been discontinued. Oh. I.thought those were off as well. The leaked kits never quite look exactly like the final ones, it's more like someone is leaking the original mock ups. The final versions always look a bit better. The guy on Twitter who is usually spot on has said something about these not being quite right but don't go on Twitter much at moment as not enough time so haven't seen if he has posted a photo or a link to the version he thinks it'll be. Well, let's just hope we don't have that chequered look. Was calling United's kit a bloody table cloth back when they had that black and red checks. If we have checks and stripes at the bottom, it is going to look like a bloody curtain in a cheap motel. Similar pictures from similar sources turned out to be true with a couple of kits in the last few seasons. Doesn't guarantee and this is probably not 100% the end product with a couple of details (and generally it does look cheapish on these pics - not that it will help with this kit), but still, let's not be surprised if they are. Tried to find a thread for our kits in general, couldn't find one so we needed one sooner or later. Should help also with some people still not informed about the name change for next season Warrior -> New Balance (already happened with boots, I think only Kolo still wears Warrior's at the moment). Bloody hell, that first kit is atrocious, even if it is a fake. The NB/Warrier designers are either playing an insider-game of "who can get away with the most ridiculous production without getting sacked".... or they are doing all their work from a Thai island fucked out off their heads on E and Acid.... where they've been working since '94. If that last kit is the real deal I'm refusing my kid to buy it. Seriously, I'm getting tears in my eyes from watching that crap and thinking about what could be instead. Fingers crossed it's a cruel joke, but something tells me it's not. That design is actually making fools of us... it's that bad. These days everything seems to just get worse all the time. That home kit makes me yearn for the days of adidas again. They were happy to just tweak a few things whereas Warrior/NB obviously feel the need to make major changes every year. Having said that, the white one looks pretty neat. Assuming they're legit it's a shame they chose that design for the away rather than the home kit. 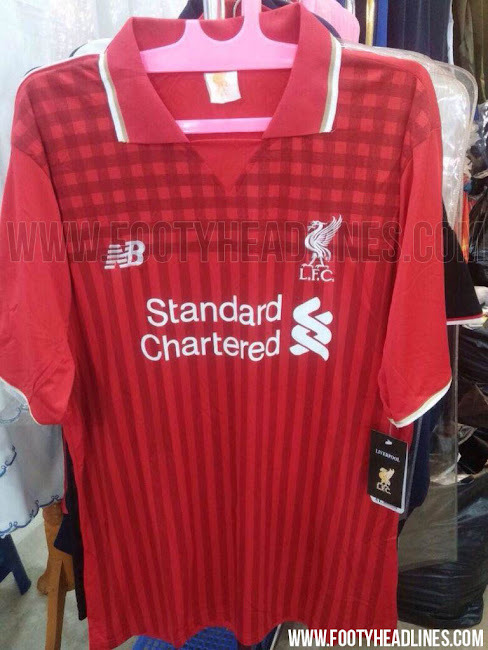 Hopefully the collar, stripes and checks go from the home shirt. The white and black kits look very nice. Much better than this years yellow and grey. I really wish we'd just stick to the simple designs we used to go with. Some of the real basic fan made designs are 100x better than our shirts this year and last year. Should go back to something similar to what we had in Rodgers' first season. The Home kits have been really nice up til now, if that is the design them meh....As for Addidas effectively every team has the same design it's pretty lazy and hell there just as bad when they try something different Swansea's away kit last year looked like a paint job by someone on E.
If they're indeed the real kit, I don't mind them. I got this seasons 3rd kit and think it's really slick but a lot of people disliked it, so maybe I'm just weird. They're alright, but I can't see Kolo getting into one. Home one reminds me of another semi-recent one. Reebok I think from the Michael Owen era. They all kind of look a bit cheap and uninspired though. Though I have seen worse. Dont look great, the only crumb of comfort is the rumoured leak of Man U kit is bloody awful. are they the real deal - how come they have tags on already when they haven't been officially released? Home Jersey is rotten. If they are the real deal i will be gutted. The white and black are quite nice. Not sold on the home kit though. Why are they trying to stuff so much pattern on there.